Some background information is necessary. Back in May, when I was finalizing the timing for this trip to the Canadian Rockies, I scheduled the first eight days at Lake Louise and Jasper; the final 5-6 days were to be spent on a photo tour centered in David Thompson Country, led by Royce Howland (much more on the tour later in this series). While I was in the process of trying to prioritize daily shooting options while staying in Lake Louise–I knew I had far more that I wanted to do than time in which to do it–I asked Royce if he had any suggestions. He threw me a curve ball by recommending something that hadn’t been on the menu–a day trip to Lake O’Hara. I hadn’t been familiar with Lake O’Hara–which is located just across the provincial border from Lake Louise, in Yoho National Park in British Columbia–up to that point, but Royce described it as “one of the crown jewels of the Canadian Rockies.” When a photographer with decades of experience in the region (Royce) makes a statement like this, someone who doesn’t know his a** from his elbow with regard to the area (me) should sit up and take notice…so I did. So, if you want to go up there for the day, you can ride up on the bus as early as 8:30 AM and come back as late as 6:30 PM, which gives you a nice, solid 10 hours on the ground. The only hang up? The number of people allowed into the area is so highly restricted (to protect the fragile alpine environment) that you must call exactly three months to the day that you want to access the area in order to have a chance to secure a spot. So, for a reservation in late September, I had to call in late June. Oh, and the phone call? The line doesn’t open until 9 AM (Mountain Time) and if you don’t get through to a person by 10 AM, you can basically forget it (the reservation space will be eaten up). Oh, and there’s no sitting on hold–if you don’t get through to the sole person answering the only phone, you get a busy signal and you have to try again. If this sounds like something from the era of Leave It To Beaver, it should. To make a long story modestly less long, I decided that September 24–my first full day, and one of only two full days I was due to spend in the area–was the day to shoot for (if you’ll pardon the pun), so I dutifully made my call at 10 AM (Central Time) on June 24…and failed to get through…again and again and again. I must have hit redial at least 300 times and finally, after about 50 minutes, I got something other than a busy signal. I literally obtained the last seat on the 8:30 bus for September 24. Hooray. A bit of foreshadowing: at some point during the summer, when I was thinking about the then-upcoming trip, I thought to myself that the one thing that I hoped to avoid on the day of the Lake O’Hara visit was an all-day rain. About five days before I was due to fly to Calgary–roughly one week before Lake O’Hara Day–I started checking the weather forecast for the Lake Louise area. You know what’s coming. At first, the forecast was calling for a chance of showers…or, at one point, a chance of morning showers. From that point, I checked the forecast daily and every day, it seemed to get a bit worse. By Sunday–the day before my flight, three days before Lake O’Hara–the forecast was simply “rain.” And it stayed that way. By the evening of Tuesday the 23rd–the day I drove from Calgary to Lake Louise Village, and the day before Lake O’Hara–the forecast was calling for a 70-80% chance of rain the next day. Great. I woke up well before dawn on the 24th, quickly got my things together and headed outside in the pitch dark. To my surprise it wasn’t raining. With my hopes up just a tad, I got in the car. It takes about two minutes to drive from the parking lot of the motel I was staying at to the Trans Canada Highway for the 10-15 minute drive west to the Lake O’Hara parking area. Before I reached the highway, the windshield was streaked with rain drops. And, unfortunately, that was to be the story the rest of the day. A light rain fell all the way during the drive to the parking area. It continued to rain as I sat in the car, waiting for the light to come up. It was still raining when I meandered over to the bus loading area, to hand in my reservation form. It rained while I sat on the bus, waiting for it to depart. It rained all the way on the ride up to Lake O’Hara. It rained as I hit the trail. And it never stopped all day long. I mean that literally. At no point during the entire day, did the rain stop. Once or twice it was very light…but it never completely stopped and most of the time it oscillated between a light steady rain and a moderate steady rain. On occasion, the wind picked up, just to add to the misery index. 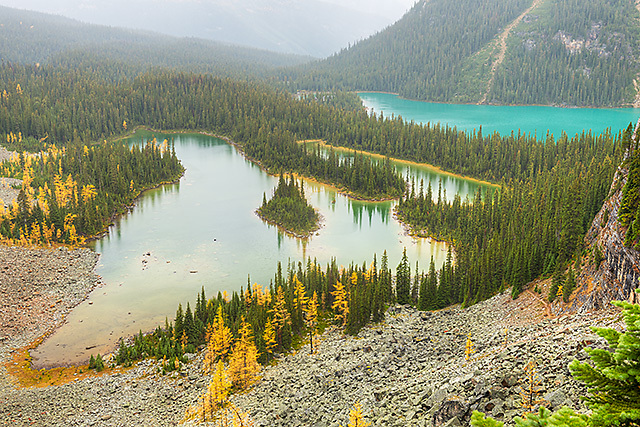 The attraction, photographically, of a trip to Lake O’Hara isn’t necessarily the lake itself. Don’t get me wrong, Lake O’Hara is quite pretty, but it isn’t obviously nicer than many other alpine lakes in the Canadian Rockies. 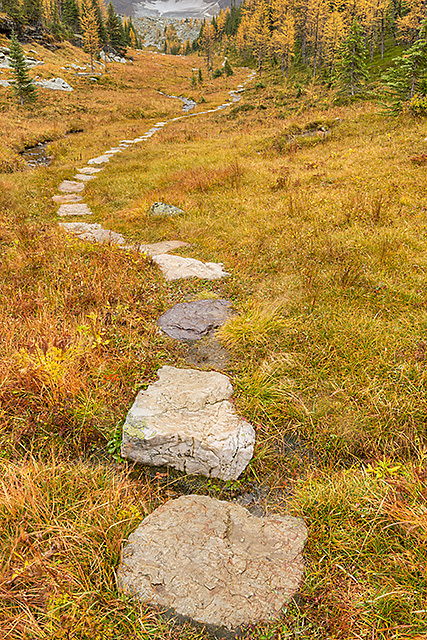 No, the appeal is the opportunity to take one of a number of trails that emanate from Lake O’Hara. Of these trails, the one that sounded the most appealing to me when I was planning the trip was the Opabin Circuit. 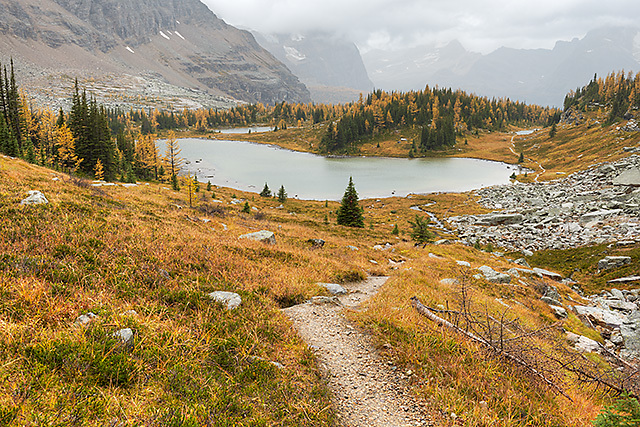 This trail loops around part of Lake O’Hara and then climbs up to the Opabin Plateau, which lies to the southeast, past several small lakes to the edge of Opabin Lake which sits below several glaciers, and then loops around the same group of lakes back toward Lake O’Hara. The Opabin Plateau sits hundreds of feet above the valley that includes Lake O’Hara, so it’s necessary to climb up, and then down. The circuit is roughly five miles in length, but contains many side routes that the hiker can take that will lengthen the trek. One of the appeals of the Opabin Plateau was the opportunity to traverse a series of larch groves. 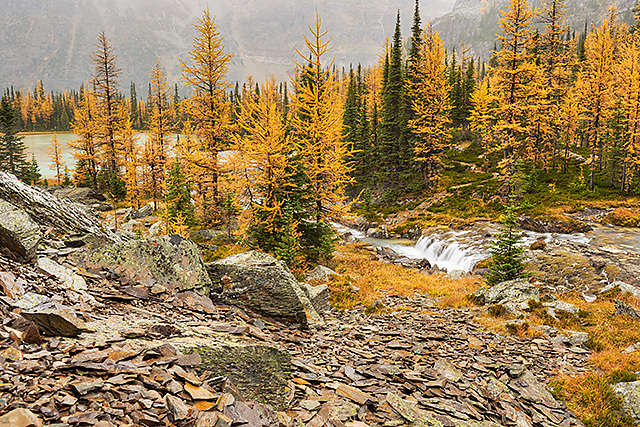 The larch is the only coniferous tree species that sheds its needles each year. In the fall, the needles turn a bright golden color before falling off. I’d seen pictures of larches in the fall and I really wanted to see this phenomenon for myself. And so, I dragged my sorry behind, through the constant rain, up to the Opabin Plateau. I ended up being on the ground in the area for about 6 1/2 hours. Even though I had dressed for the occasion, I still got drenched, as did my gear. I know of a number of people who claim that they enjoy photographing in the rain. Obviously these people are suffering from one of several serious mental defects, because I’m here to tell you that it’s a miserable experience. Off-and-on rain is annoying, but workable. Extremely light rain–drizzle, say–can be dealt with. Steady rain, in a place utterly devoid of shelter (e.g. the Opabin Plateau) is another thing entirely. It’s almost impossible to keep the front lens element (or filter) dry, which makes picture taking unpleasant at best. It’s also nearly impossible to change lenses. And, if your equipment–cameras and lenses–isn’t weather-sealed, shooting is basically a non-starter. On this day, over 6 1/2 hours in the field, I created a grand total of 12 unique shots. 12. Two of those 12 were basically grab shots, and a third was essentially ruined because I was evidently in such a hurry to get the camera out of the rain that I goofed up my focus settings and ended up with a soft foreground. The other nine shots accompany this entry. Hopefully the images I’ve included here provide some semblance of the jaw-dropping beauty of the place. With everything soaking wet, the colors were naturally heavily saturated. 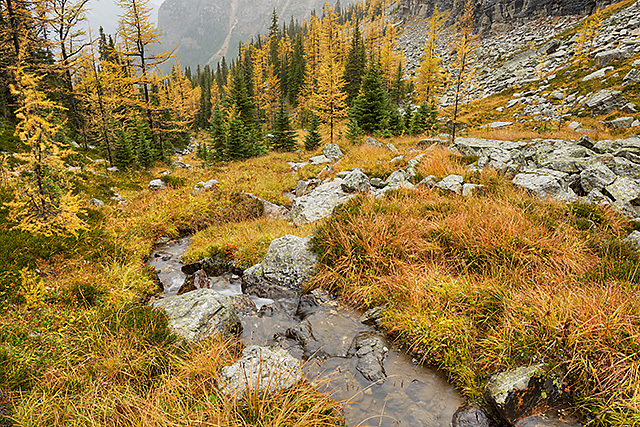 There was a golden color to both the larch trees and the grasses (which were already in the early stages of dormancy, with winter approaching). Even with the flat light, lousy visibility and the relative lack of reflections (a function of the wind blowing ripples on the lake surfaces), I think you can get a sense of what I was seeing with every step I took, in every direction I cast a glance. I can only imagine what the place would have looked like with anything approaching a clear vista, in any direction. 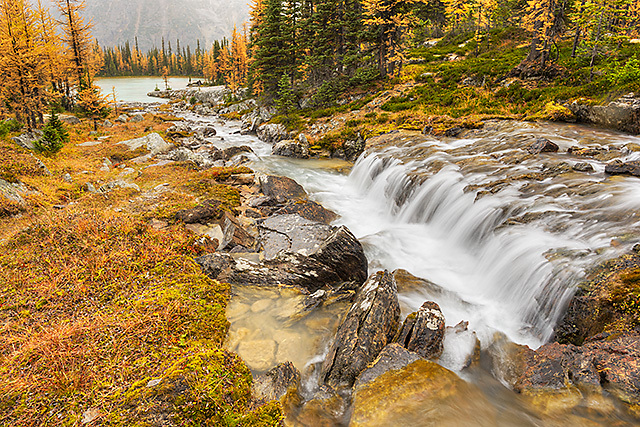 My discovery of an inlet stream to Hungabee Lake and the ensuing cascades and waterfalls was one of those “I have to get a shot” (or in this case, two) situations. Lying at the northern end of the Opabin Plateau is a rocky outcropping called the Opabin Prospect. 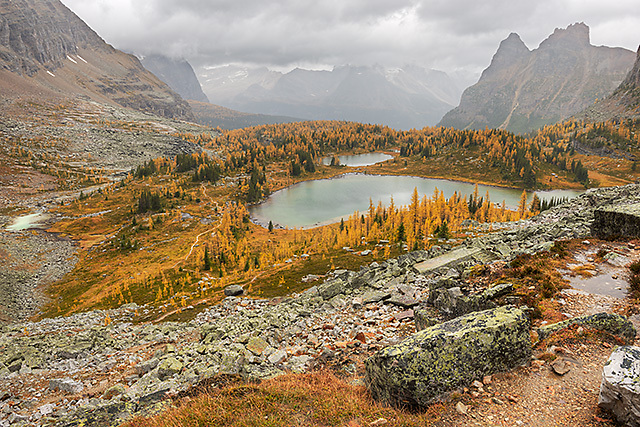 It overlooks the valley including Lake O’Hara and, even with the wind blowing rain in my face, I had to figure out some kind of way to get out to the edge and produce one image. On my descent back to the valley, via the West Opabin Trail, I photographed the valley lakes from a slightly different perspective. By the time I reached the valley floor–still about a mile short of the Le Relais shelter, which doubles as the Lake O’Hara bus depot, the rain had hardened. It was now mid-afternoon, and I had decided to take the next bus out (4:30 PM–I had a good, solid hour wait); I’d abandoned any plans to photograph around Lake O’Hara, given how cold and wet it was. It was a good call on my part, because not five minutes after I reached the shelter it started to really pour. For the next 90-odd minutes the rain alternated between hard and steady and outright downpour. The steady rain continued on the ride back to the parking area and all the way back to Lake Louise…and as far as I know, didn’t stop until some time well after dark. I spent a good chunk of the evening using a hair dryer to dry out my backpack, hiking boots, and articles of clothing. It had been an interesting day. The conditions (as I have undoubtedly demonstrated) were awful, but the place itself had been mind-blowing. I was left with the knowledge that I’d had my only crack at it. (I later found out that the next day–the only other day that it had been an option to secure a reservation–was a rerun in terms of all-day rain–which shocked me because I spent the day in and around Moraine Lake and Lake Louise and it didn’t rain at all.) I was left to ponder the means by which I could return to Lake O’Hara some day, in an attempt to give the place its photographic due through my eyes. Agreed, the area really must be seen first hand to be truly appreciated, and I definitely think you’ve hit on one of the primary reasons why–the sense that you’re standing in the middle of it and incredible things can be seen no matter which direction you look. I think the Kootenay Plains area (which I’ll cover down the pike) probably epitomizes the 360-degree aspect of things as well or better than any other spot I visited during the trip, but it’s truly a ubiquitous concept in the region. Isn’t Kerry just totally amazing Jerry? Wow, what an amazing day, and the determination it took for Kerry to trudge through the rain to get these spectacular images. Truly the journey will never be forgotten and truly worth the effort. Makes me want to buy some underwater housing for my camera kit for days just as this. Such an incredible series Kerry and thank you so much for sharing your story. It was well worth the effort. Thanks very much, Emily, for the exceptionally kind words. Lovely shots even in the rain. Not usually bothering with sophisticated post processing and often using super zooms and the like, especially on long hikes, I do like the fact the highlights and shadows are more controlled when the sun is not shinning bright. Your photos are gorgeous, in spite of the horrible weather. I give you a lot of credit for going out and shooting in the rain. I would have thrown in the towel. 1) the (unrealized) hope that it might actually stop, even for a few minutes at some point. 2) the recognition that there was no “trying again tomorrow”; I experienced this place then and there or I didn’t experience it at all. The last image included in this post was the final shot of the day for me, after which time I’d pretty much checked out psychologically. The descent back to Lake O’Hara from the plateau, on the West Opabin Trail, wasn’t much fun; it’s an extremely steep trail at that point, which was rapidly turning to a combination of mud and wet rocks, and the rain was starting to come down harder. At that stage I just wanted to get down safely and get out of the wet. 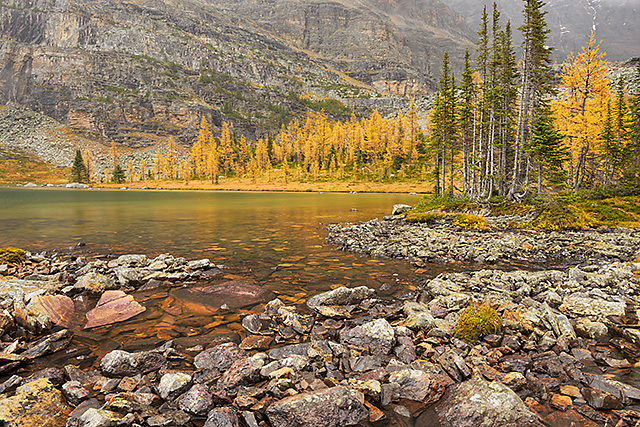 We’ve had the conversation about how absolutely, unbelievably gorgeous Lake O’Hara is. Your photos demonstrate your determination to capture some of the beauty regardless of the conditions. I recognized Hungabee Lake even before I read the caption. You are meant to be here. I know you’ll be back. Great work, Kerry, despite what you had to endure to get the work completed. We can only image what it would have looked like without the rain. These are wonderful photos, despite the conditions, Kerry. The story, on the other hand, is absolutely priceless. The Lake O’Hara experience was, by leaps and bounds, the biggest disappointment of the trip. The second biggest was probably being unable to hike the Larch Valley Trail (which emanates from Moraine Lake) due to the group hiking restrictions in place at that time of the year (a function of bear activity), but I knew long before I left that this was the case. The thing about Lake O’Hara is that a reservation has to be set up so far in advance (three months) that there’s obviously no way to know what kind of weather you’ll get on the access day itself. And given how highly variable–and localized–weather conditions are there, it’s always going to be a crap shoot. In any case, as unfortunate as this was, by no means did it ruin the rest of the trip–not even close, in fact. While there were a few other fizzle situations (e.g. sunrises or sunsets that didn’t really materialize), that’s utterly predictable over a two-week period, and for the most part conditions were pretty good the rest of the time. Wonderful work. I love the high vantage points! Hey Kerry: I agree with your comments about photographers who say they “like” shooting in the rain. I can recommend a good psychologist 😁 . Over the years, I have been very fortunate with weather, when I have committed a slot of time and $ for a trip somewhere I may not get back to easily. The one or two experiences where I have had rain have been situations where, like you did here, I have just had to make the best of a bad situation. I have made a couple images over the years where I have applied the old saying about lemonade from lemons. You did that here. I am glad you hung in there long enough to make your penultimate image – I really like it. It is unique and I might even choose it over one in which the weather was much nicer. As always – impressive work, reflecting you great preparation, determination and vision! Thanks very much, Andy. I’ve been fairly lucky with conditions myself, for the most part. There have been exceptions, of course, and this Lake O’Hara experience was the most noteworthy and disappointing of them. The image you singled out is worthy of a bit of background. 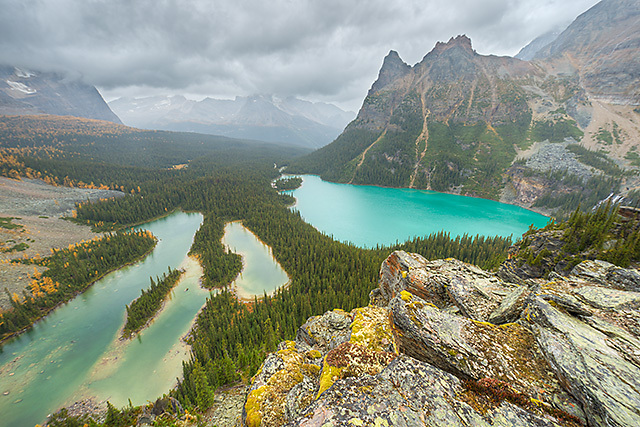 I wanted to include all of Lake O’Hara (the lake to the right in the image) in the shot and I also wanted to include a bit of the rock face that forms the Opabin Prospect itself as part of the foreground for the purposes of depth, without having the rock merge with the background lake. That meant a bit of finagling with the tripod/camera position. The Opabin Prospect is a bit uneven, and there are some places where you have to step or jump over some good-sized gaps in the rocky floor to get where you want to go. In dry conditions, without the burden of a tripod and camera gear, these wouldn’t even merit a consideration, but with everything soaking wet and footing being less than ideal, I had to be pretty careful when maneuvering around. This was also the one time during the day that I changed lenses, from the 24-70 to the 14-24 (24 mm wasn’t wide enough). The rain (and wind) made this very difficult, but I managed to find a small overhang, about three feet above ground level, under which I placed my backpack and made the switch in the relative shelter of that position. Ah Kerry, in spite of the difficult conditions, you captured magic through the lens. Thank you for sharing the great story as well as the spectacular images. The 4th photo has drawn me back over and over to look at it again. The shot you referenced came as I hit a high spot, overlooking most of the northern 2/3 of the Opabin Plateau itself. It was raining (of course), and the wind started blowing while I was trying to size up the shot, and it was swirling, which was a real pain in the behind. The worst part was that I could see that I needed a polarizer on the lens to kill the glare coming off the water surfaces you see in the frame. Just attaching that filter, under the conditions, was a royal pain in the behind. I draped a plastic bag I had with me for just this sort of contingency over the entire tripod-mounted rig and screwed the filter on the front element of my 24-70 mm lens. This wasn’t easy because, in addition to the obvious problems of working with the inside of the bag, the wind was blowing it all over the place, making things even more difficult. Then there was the problem of properly rotating the filter without getting it splotched with rain drops…ugh, this retelling of the story is bringing the whole thing back to me in glorious technicolor. 🙂 Geez, that whole experience was frustrating. The amazing thing, Kerry, is that you persevered and got such gorgeous shots, in spite of horrible conditions. I must admit I am a fair weather photographer and gardener; I think I’m just getting too old to deal with those conditions. So, kudos to you for hanging in there and taking away something so extraordinary! Thanks again, Lynn, for the kind words. I really appreciate it. In spite of myself, I’m not satisfied with the Lake O’Hara area shots, at least in part, because I had a chance to get a sense of the real potential of the place, and how far short of that potential I fell. The dissonance on my part is so acute that I’m seriously attempting to see if I can manage to get back there next fall and rectify the shortcomings. I haven’t felt an urge this strong to return to a location at least since my first visit to the Canaan Valley area of West Virginia in October, 2010. The conditions during my few days there were so bad (lousy color, high winds and blue sky days) that I came back with very little that was worthwhile despite the incredibly obvious potential. I went back for a full week the following autumn and scratched that itch, quite successfully, I think. This experience isn’t entirely analogous since I most certainly didn’t strike out for the entire time in the Rockies–quite the contrary, in fact (I came back with so much that even now, three weeks after returning, I still haven’t worked up at least 60% of my shots). My disappointment is almost entirely limited to Lake O’Hara itself, but I can’t seem to help myself in terms of the desire to get back there. We’ll see what happens. I empathise with your weather experience, as it has happened to me but it does show how beautiful it is even in adverse conditions.I love the golden glow in the fifth photo of Hungabee Lake and the vista in the second-last one. Thanks, Jane. Glad you noticed that glow in the one Hungabee Lake image–it was the only time all day (this would have been early in the afternoon) something like that happened. This was at a point where I actually thought the rain might stop–it was very light at that stage and things brightened considerably very briefly. I never actually saw any sunlight, but there must have been a significant thinning of the cloud layers. It lasted for a minute, perhaps. Then it got darker and the rain picked up again and it never really slackened for the remainder of the day.